With the CData ODBC Driver for Google Sheets, you get live connectivity to your Google Sheets data, allowing you to build real-time charts, graphs, and more. The CData ODBC Driver for Google Sheets enables you to access live Google Sheets data in business intelligence tools like Tableau. In this article, you will integrate Google Sheets data into a dashboard that reflects changes to Google Sheets data in real time. The CData ODBC Drivers offer unmatched performance for interacting with live Google Sheets data in Tableau due to optimized data processing built into the driver. When you issue complex SQL queries from Tableau to Google Sheets, the driver pushes supported SQL operations like filters and aggregations directly to Google Sheets and utilizes the embedded SQL engine to process unsupported operations (often SQL functions and JOIN operations) client-side. With built-in dynamic metadata querying, you can visualize and analyze Google Sheets data using native Tableau data types. You can connect to a spreadsheet by providing authentication to Google and then setting the Spreadsheet property to the name or feed link of the spreadsheet. If you want to view a list of information about the spreadsheets in your Google Drive, execute a query to the Spreadsheets view after you authenticate. You can authenticate with a Google account, a Google Apps account, or a service account. A service account is required to delegate domain-wide access. The authentication process follows the OAuth 2.0 authentication standard. See the Getting Started section of the help documentation for an authentication how-to. Follow the steps below to create data visualizations of a Google Sheet that contains typical data on Orders, stored in columns like Shipcountry and OrderPrice. 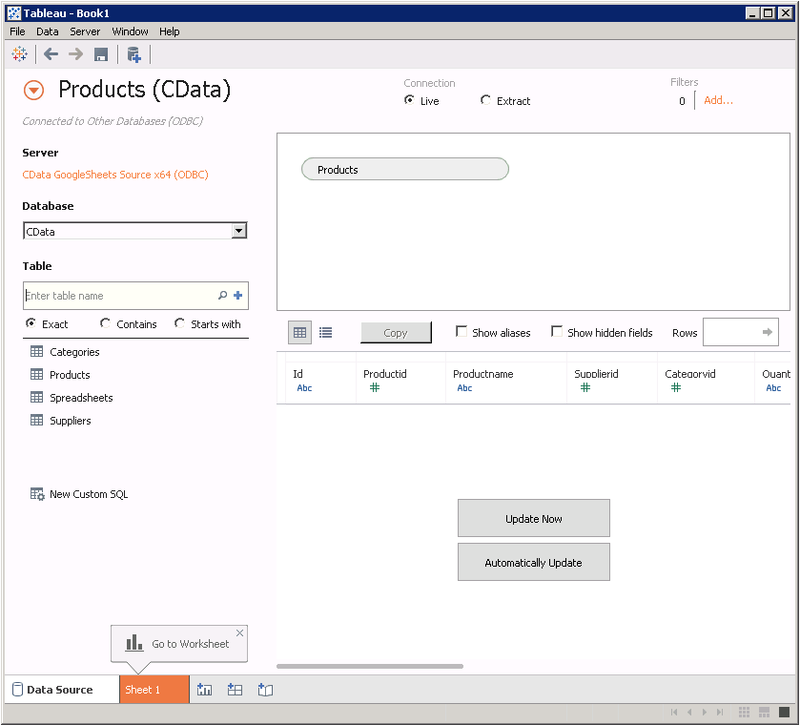 In Tableau, click Connect to Data > More Servers > Other Databases (ODBC). Select the CData Data Source Name (for example, CData GoogleSheets Source). In the Database menu, select CData. In the Table box, enter a table name or click New Custom SQL to enter an SQL query. Drag the table onto the join area. At this point, you can include multiple tables, leveraging the built-in SQL engine to process complex data requests. In the Connection menu, select the Live option so that you skip loading a copy of the data into Tableau and instead work on real-time data. The optimized data processing native to CData ODBC drivers enables unmatched performance in live connectivity. Click the tab for your worksheet. Columns are listed as Dimensions and Measures, depending on the data type. 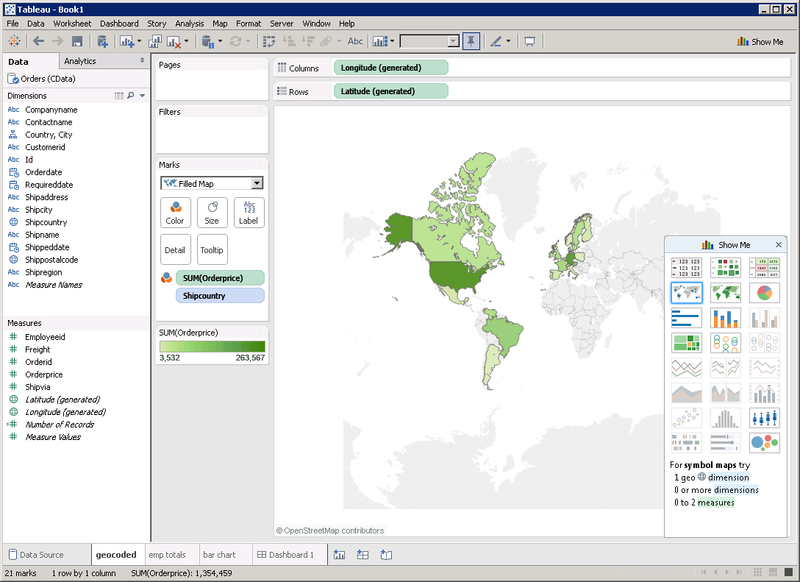 The CData driver discovers data types automatically, allowing you to leverage the powerful data processing and visualization features of Tableau. Drop the Shipcountry column in the Dimensions pane onto the dashboard. When you select dimensions, Tableau builds a query to the driver. The results are grouped based on that dimension. In Tableau, the raw query is automatically modified as you select dimensions and measures. When you select a measure, Tableau executes a command to the driver to calculate a summary function, such as SUM, AVG, etc., on the groups. 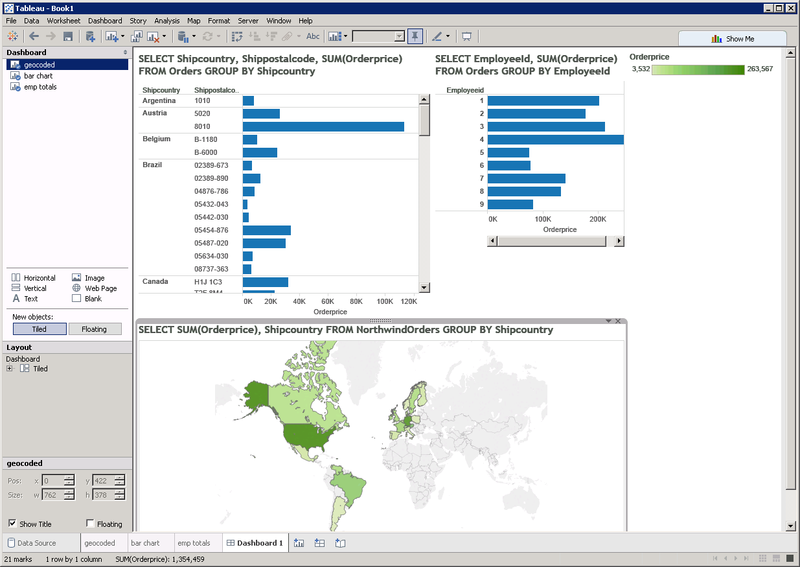 The SQL engine (embedded within the driver) is leveraged to process the aggregation of the data, where needed, providing a seamless experience in Tableau, regardless of the data source. To change the summary function, open the OrderPrice menu and select the summary you want in the Measure command.